I’m in the market for a new netbook. My Dell Mini 9 has had a good run, but after 18 months, three falls and one virus attack, it may just be time to consider my other options. So, when the lovely people at Asus offered me the opportunity to try out their Asus EeePc 1008HA (Seashell) (in a pretty pink colour no less) I snapped up the chance to check out the competition. 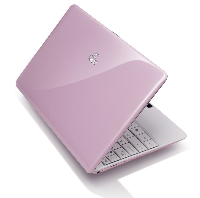 The EeePC 1008Ha gets its ‘Seashell’ name from the curved corners and 1″ slimline casing. Lightweight without compromising on screen size, this netbook boasts a 10.1″ screen, a large keyboard, and a multi-finger gesture input touchpad for easy scrolling and zooming. 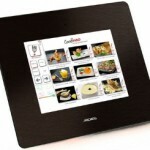 Other features include the standards like Windows 7, up to 6 hours battery life, 1.3-megapixel camera and bluetooth. The hinge of the screen seems a little flimsy for me, especially considering my dropping habit. On the upside, the light screen stops it toppling over. 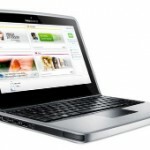 I like this netbook, I just haven’t quite fallen in love with it. Saying that, its convenient design, speedy internet access and long battery life all win points with me, and I wouldn’t hesitate in recommending it to anyone looking for a slimline web-surfer and light work machine. 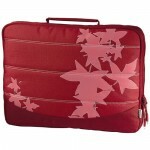 You can buy the Asus EeePC 1008HA Seashell for £249.